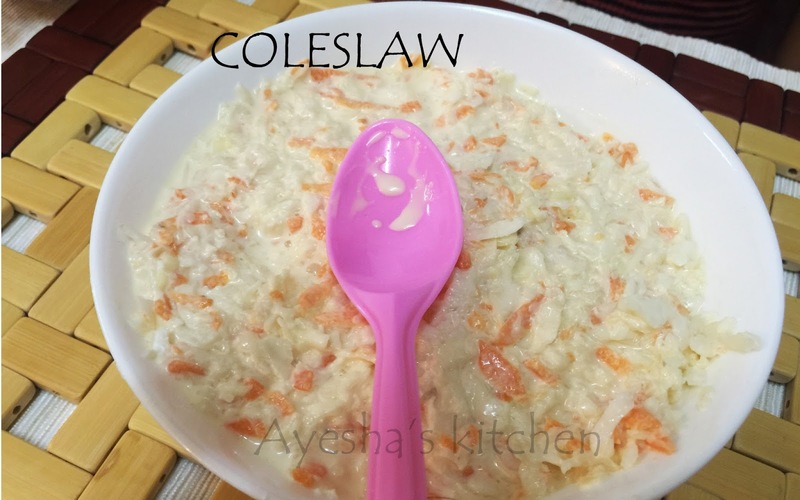 Hi foodies...Welcome to AYESHA'S KITCHEN...How about a creamy home made coleslaw. Here it is..Coleslaw is a salad consisting of finely grated cabbage and carrot with a creamy dressing. KFC is not perfect without coleslaw. This classic recipe for kfc coleslaw is very easy to make and has a creamy yummy taste that goes well with KFC and other fried chicken. Here am going to share a simple delicious creamy kfc coleslaw recipe with video. Hope u all love this recipe. So lets see how to make kfc coleslaw recipe / kfc coleslaw dressing /kfc coleslaw salad recipe /copycat kfc coleslaw. Enjoy!!! Mix together all the ingredients in a bowl except cabbage and carrot. Blend well with a spoon or whisk well until well combined. Add the grated cabbage and carrot to this creamy mixture. Mix gently until well combined. Do not make the coleslaw watery. So add the prepared coleslaw dressing accordingly. Refrigerate for 2 hours. Do not freeze.